Gravity is an important part of geodesy, with implications for height measurements and many other applications. In this module, we explore the concept of equipotential surfaces and relate them to gravity. Then we discuss geodetic applications that rely on accurate gravity measurements, including leveling surveys and floodplain mapping. We introduce a special surface based on gravity, called the gravimetric geoid, and explain why we want to use it as a reference datum. 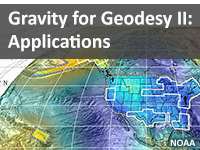 We discuss how to measure Earth’s gravity and introduce you to the National Geodetic Survey’s GRAV-D project, including how and why the U.S. and a number of other countries plan to use a gravity-based vertical datum. I will definitely apply the information I learned taking this lesson to my future surveying methods. gracias por el conocimiento transmitido. quiz questions were bit tricky but overall good. A good short course but it's important to do Gravity for Geodesy I if like me you're new to this subject area. this course is extremely practical, but the only thing I want to know if we wanted the documents how could we get them back since there is some restriction. My first course. Found it to be a great resource but took course out of order and it referred to information from earlier lessons. I intend to make up the earlier courses. Define an equipotential (level) surface. Describe how level surfaces aren’t parallel and their spacing changes. Explain the impact of gravity variations in determining flood plains. Explain how orthometric correction is applied to leveling measurements. Explain methods for measuring gravity. Define the geoid and its relationship to gravity and sea level. Explain why models of the geoid are necessary. Give examples of places where airborne gravity can collect better data than other gravity methods. Explain the goals of GRAV-D program. Explain that the gravity field varies over time.